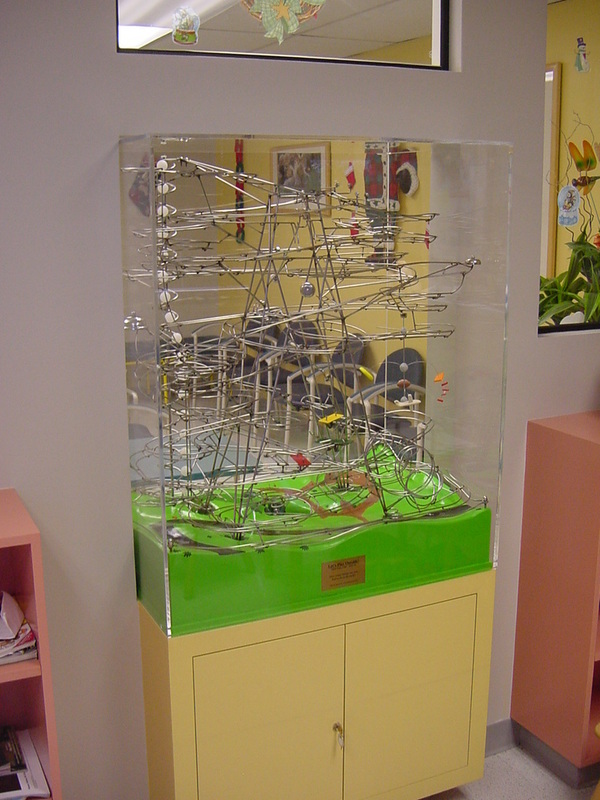 This sculpture is a highly themed piece commissioned by the Pediatric Unit of the Huntington Medical Foundation in Arcadia, CA. The sculpture is an integral part of the dividing wall that separates the sniffling children from the smiling children in the waiting area. It is fully enclosed in an acrylic case and is designed to work continuously during business hours. The strong theme of this sculpture is intended to inspire children to think about the kinds of activities they could do outside. The plaque on the front asks, "How many things can you find to do at the park?" 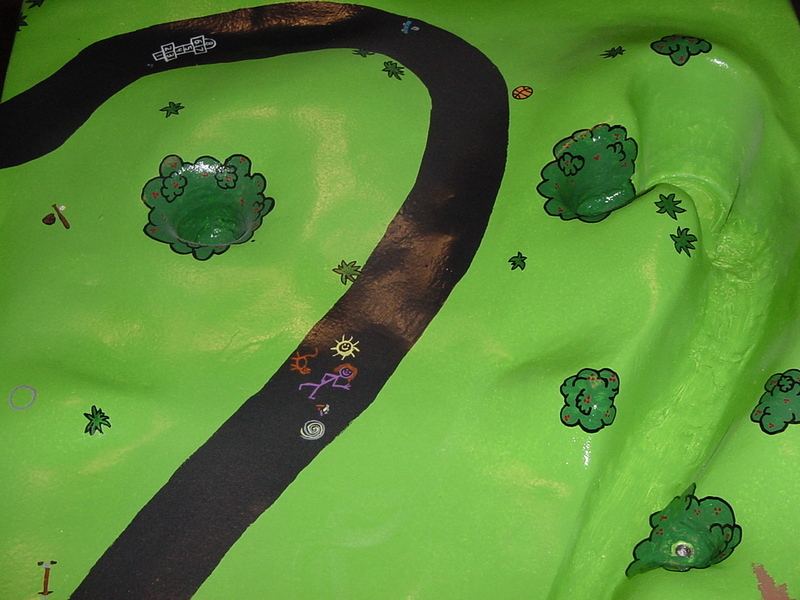 The theme is conveyed through images of the activities painted on the base of the sculpture. The theme is continued within the sculpture using an exciting mobile with models of toys that fly through the air. This Sculpture has a nice geometric main frame with exciting track elements revolving around. One Screw lift operating at three revolutions per minute supplies one inch balls to three track switches and four tracks. Some of the unique track elements include a roller-coaster style triple-loop, a spinning mobile, curving xylophone steps, and swing-arm acrobatic maneuvers. The most fun and surprising element of this sculpture is the ball collection system. 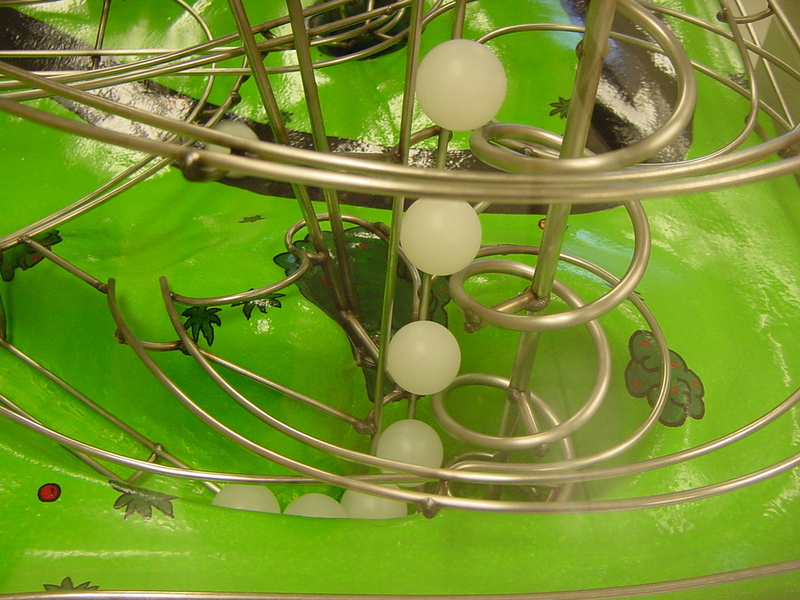 The green base represents the rolling hills of a park, while providing a sloping surface to funnel the balls back to the lift. The irregular patterns of the sloped surface cause the balls to roll around in different directions every time. This adds to the excitement of the display, while increasing the value of the overall theme. This sculpture was installed in December of 2004.